Love Field is a neighborhood located in northwest Dallas, Texas (USA). It lies southwest of and is adjacent to Dallas Love Field Airport and is bounded by Denton Drive, Inwood Road, Harry Hines Boulevard, and Webb Chapel Extension. The neighborhood takes its name from Love Field Airport. The main business in Love Field is Dallas Love Field. 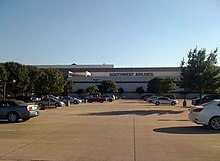 Southwest Airlines' headquarters are located at 2702 Love Field Drive, adjacent to the airport. There are several other large manufacturing plants in the neighborhood. The only body of water within Love Field is Bachman Lake. It lies between Northwest Highway and Dallas Love Field. Other notable areas are the park around Bachman lake as well as several runoffs from the Trinity River. The Dallas Independent School District operates local public schools. The area is within the Board of Trustees District 8; as of 2008 Adam Medrano represents the district. Obadiah Knight Elementary School, a public elementary school, is within Love Field. All residents zoned to Knight are also zoned to Thomas J. Rusk Middle School and Thomas Jefferson High School . Our Lady of Perpetual Help Catholic School is a Roman Catholic school of the Roman Catholic Diocese of Dallas. OLPH students range in age from Pre-K to eighth grade. OLPH is located across the street from Knight Elementary School. ^ "Trustee District 8 with School Locations." Dallas Independent School District. Retrieved on November 24, 2008. ^ "Board of Trustees Archived 2008-12-05 at the Wayback Machine." Dallas Independent School District. Retrieved on November 24, 2008. This page was last edited on 1 August 2018, at 00:21 (UTC).